Wall register covers are offered with a choice of six beautiful finishes to choose from. Decorative air vents are shipped with matching hardware for mounting. Steel Crest wall register covers are crafted with steel that is 1/8 of an inch thick. 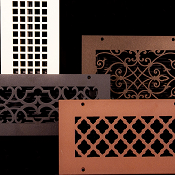 Decorative air vents can be purchase in six distinctive designs for a unique look. Wall register covers will bring a designer's look to your home or office. These decorative air vents are an American made product. 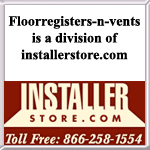 Important: Decorative air vents will take 5 to 8 weeks to be manufactured and shipped. There are rush shipments (2 to 4 weeks) and beveled edging available for an extra charge (please call for information). All wall register covers are special order, non-returnable and cannot be canceled once payment is receieved. Fell free to contact us with any questions regarding these decorative air vents or color sample requests. Color samples of the finishes can be sent to you for a small deposit which will be refunded upon their return. Check out our other coordinating Steel Crest items for a seamless look. Steel Crest wall register covers are an affordable option when you want a unique look or need a custom size, order today!